Renal Cell Carcinoma (RCC) is the most common type of kidney cancer, accounting for approximately 85% of all malignant kidney tumors. In RCC, cancerous (malignant) cells develop in the lining of the kidney tubules and grow into a mass called a tumor. Like many other cancers, the growth begins small and grows larger over time. RCC typically grows as a single mass. However, there are cases where a kidney may contain more than one tumor, or tumors are found in both kidneys at the same time. Clear Cell - approximately 75% of individual cells appear very pale or clear under the microscope. Papillary – approximately 10% to 15% of people have this form. These cancers form little finger-like projections (called papillae). There are two types of papillary tumors. Chromophobe – approximately 5% of cases. These cells are larger and have prominent cell borders and can appear pink or clear. Clear cell papillary – approximately 2-4% of all cases. A new subtype with features of both papillary and clear subtypes. These are often less aggressive. Collecting Duct – approximately 1% of all cases. Aggressive type arising from the collecting system that forms irregular tubules. Medullary – approximately 1% of cases. A very aggressive type often occurring in young African Americans with sickle trait. Unclassified – approximately 2-3% of tumors that do not fit into any other category. Urothelial Carcinoma: arise from the renal pelvis and resemble bladder cancer cells. These are genetically similar to urothelial cancer of the bladder and have similar risk factors such as cigarette smoking and occupational exposures to certain cancer-causing chemicals. Wilms Tumor: a rare pediatric malignancy in children 2-5. 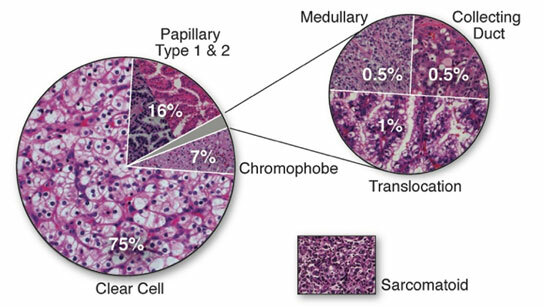 Renal Sarcoma: a rare type of kidney cancer (< 1%) arising from the connective tissue. Renal Adenoma: small, slow growing, benign tumors < 1 cm. Oncocytoma: a renal tumor that can grow large but not spread. It often resembles kidney cancer on a biopsy. The UCLA Kidney Cancer Program has molecular imaging modalities to identify these types of tumors non-invasively. Angiomyolipoma: a benign tumor containing fat, vessels, and muscle. When large they can bleed so treatment is advised when >4 cm.